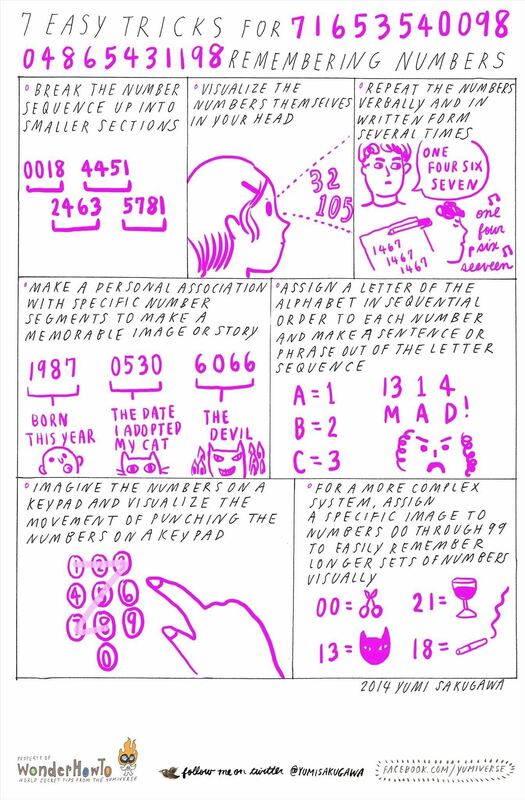 For long number sequences, your best strategy is to break them up into smaller chunks and make memorable or personal associations out of the smaller number chunks. For shorter numbers such as PIN numbers or access codes, simply repeating the number sequence verbally many times or assigning a letter to each number can help you remember. If you are truly committed to the art of remembering long number sequences, take a cue from a number memorization expert and assign an image to each two-digit number from 00 to 99 so that long numbers can be remembered in a series of unique images. Also, make sure you're eating plenty of brain power foods!